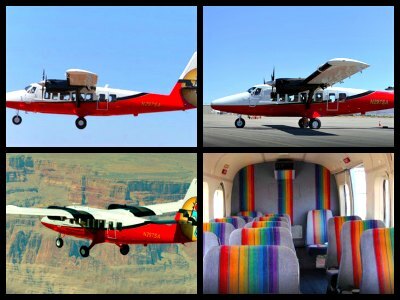 Scenic Grand Canyon air tours from Las Vegas in executive-style airplanes is an experience to write home about! Below I found the best deals - for airplane tour packages from Las Vegas to Grand Canyon West, as well as to the remote North and South Rims. 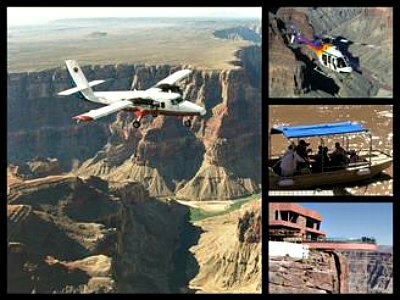 For even more fun you can combine your air tour of the Grand Canyon with Skywalk, or add boat and motorcycle excursions or other activities Flight prices vary from $129 for air only tour, to $399 for helicopter and airplane tour, to $441.99 for overnight stay at the North Rim (seasonal). This air-only tour is the cheapest way to admire the Grand Canyon and other great landmarks located around Las Vegas from above! These Grand Canyon air tours from Las Vegas do not have any extras - no landing, no sightseeing - just pure delightful airplane ride, accompanied by a recorded commentary! 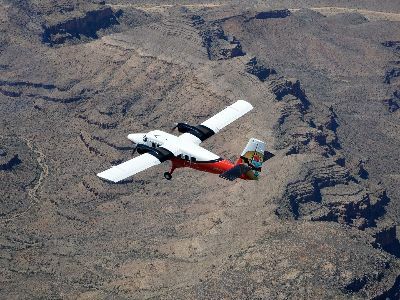 Upon being picked up from your hotel, this scenic airplane flight on a 19 passenger plane departs from Boulder City and takes you to the Grand Canyon. On the way, you will fly over the Hoover Dam and Lake Mead. This airplane has huge panoramic windows, perfect for taking unforgettable pictures. If you are on a tight budget yet would like to see the miracle that is the Grand Canyon, taking this airplane tour is a godsend! 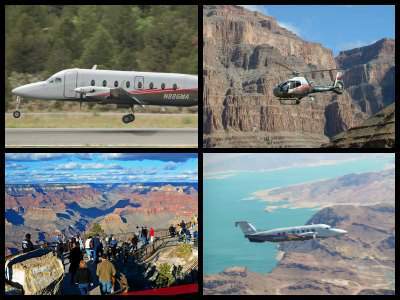 This is the perfect Grand Canyon air-only tour departing from Las Vegas offering the best sights to see in the surrounding Las Vegas desert. Your journey begins with hotel transportation service to Henderson Executive Airport where you will board a unique sightseeing aircraft, the Cessna Grand Caravan. This state-of-the-art airplane is equipped with large viewing windows and interesting commentary from a local tour guide. You will soar above the Mohave Desert, Hoover Dam, Historic Boulder City, and Lake Mead. But the view is more impressive as you glide over the Grand Canyon and Colorado River. Start and end this four hour tour with hotel transportation service. Per FAA regulations, valid government issued photo identification is necessary for anyone over 18 years of age. Children under 2 require proof of age. This adventure is packed with excitement, sightseeing and glory of Grand Canyon National Park. 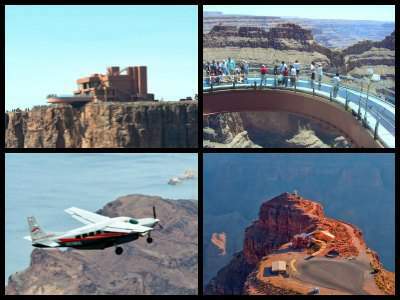 These six hour long Grand Canyon air tours begin with hotel pick-up that will take you to Henderson Executive Airport. Climb aboard a spectacular sightseeing airplane and soar above the awesome Mojave Desert, Hoover Dam, Lake Mead and the Grand Canyon. Once you land at the West Rim, you will have two and a half hours to explore the upper rim at such spectacular viewing areas as Guano Point and Eagle Point. Enjoy a complimentary lunch at one of three locations. 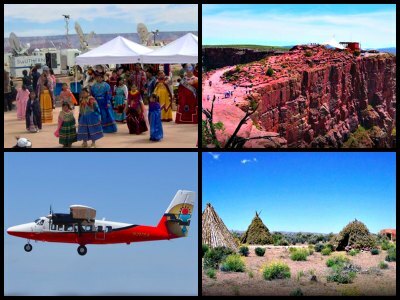 If you stop at the Hualapai Indian Village then you can upgrade your trip (additional fee) with an once-in-a-lifetime experience on the Skywalk. The Skywalk is a horseshoe shaped glass bridge that allows you panoramic views both downward some 4,000 feet or 360 degree above the canyon. End your excursion relaxing and soaking up more beautiful landscape as well as hotel drop-off once you land. Patrons over 18 years of age must have valid government issued identification. Children under 2 require proof of age. There are no cameras allowed on the Skywalk. This adventure is perfect the person that is looking for a journey flying above one of the world’s greatest places. These Grand Canyon air tours start at the Henderson Executive Airport, where you check-in to board a specially equipped Beechcraft 1900D. You will enjoy a luxurious flight over such interesting sites as the Hoover Dam, Lake Mead, and Mojave Desert, and then you will land at the West Rim of Grand Canyon. From here you will be shuttled to such viewing vistas as Guano Point and Eagle Point. Enjoy a complimentary boxed lunch at one of these gorgeous areas before deciding if you wish to experience the Skywalk for an additional fee. Tour includes hotel pick-up and drop-off service. Patrons over the age of 18 years old must provide a valid government issued identification, per FAA regulations. Children under 2 require proof of age. 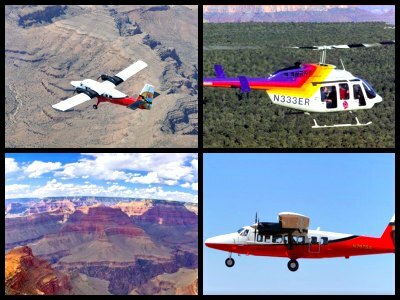 These Grand Canyon air tours pack adventure, adrenaline, sightseeing and a cultural experience all rolled up into one sweet day. Hotel pick-up will shuttle you to Henderson Executive Airport where you will step into a superb sightseeing aircraft. You will fly above the magnificent scenery as you approach the Grand Canyon. After landing at the West Rim, you will be swooped down to the canyon floor some 4,000 feet below on a sophisticated helicopter for great photo opportunities. Once back up on the canyon rim, you will have two and half hours to explore on your own. Great vistas like Guano Point and Eagle Point are perfect while you decide if you want to upgrade (additional fee) your excursion by taking a stroll along the Skywalk. Return by airplane and enjoy hotel drop-off to conclude your six hour adventure. Valid government issued identification is needed for people 18 years of age or older, per FAA regulations. Children under 2 require proof of age. This is the bomb adventure when you want to see all of the Grand Canyon while flying in comfort and walking your own way at the park. 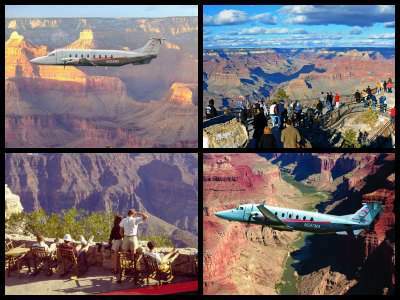 These Grand Canyon air tours start with a hotel pick-up service that will drive you to the Henderson Executive Airport where your Beechcraft 1900D awaits your arrival. Soar above the Hoover Dam and Lake Mead as you make your way towards the majestic Grand Canyon. Once landing at the Grand Canyon Airport, you will climb aboard a spectacular Eco-Star helicopter that will fly you some 4,000 feet down to an excellent viewing spot of the mighty Colorado River. Once back on the rim, you will shuttle to the Bright Angel Lodge on the South Rim. Here you will have one and half hours to explore the many trails and museums that exquisite. Enjoy a complimentary boxed lunch in a quiet area overlooking the grandeur of nature’s wonders. Return flight and drop-off hotel service will conclude this perfect day. People over the age of 18 years must have valid government issued identification, per FAA regulations. Children under 2 require proof of age. These Grand Canyon air tours from Vegas are bound to give you an unforgettable experience. You will fly to the Grand Canyon in an airplane, land at the West Rim where the majestic Skywalk is located and take a sightseeing tour in a bus. This tour is accompanied by a live narration, highlighting the history of the canyon and Hualapai Indians that live at the West Rim. At the West Rim, you will visit 2 major observation points - Guano Point and Eagle Point. What's even better, you will be treated to a free lunch, all the while admiring the magnificent Grand Canyon! The Skywalk is not included in the minimum price of the Grand Canyon West Rim airplane tours, but you can upgrade if you wish to visit it. And I highly recommend that you do - after all, no observation point offers better views than this glass bridge! This is a great tour for the person that likes to see the sights from above as you soar through the skies in a unique sightseeing built airplane. Your adventurous Grand Canyon air tours start with a pick-up from Las Vegas hotel that takes you to an exclusive airstrip at Boulder Airport. Here you will board the most advanced airplane for sightseeing in the world. You will fly above such fabulous and historic sites as Hoover Dam, Lake Mead, Colorado River and the grandeur of the Grand Canyon. Your plane will land at Bar 10 Ranch where even more fun awaits when you hop aboard a Polaris Ranger ATV. You will maneuver over 4x4 trails through Whitmore Canyon and continue through the awesome landscape of Lake Mead. Your ATV quest is fulfilled when you arrive at the Grand Canyon and peer some 3,000 feet above the canyon floor. On your return to the Bar 10 Ranch, you will enjoy a BBQ lunch before heading back through the wild blue yonder to Sin City. Lots of photo opportunities are available throughout the journey with an interesting narrative by a local tour guide. ATV drivers must 16 years of age with a valid driver’s license. Follow FAA guidelines for flight restrictions. To make Grand Canyon air tours from Vegas, you can add to your a descent to the bottom on board of a helicopter to your airplane flight from Las Vegas! All the way from Las Vegas, you will enjoy the bird's eye view of the awe-inspiring panorama. 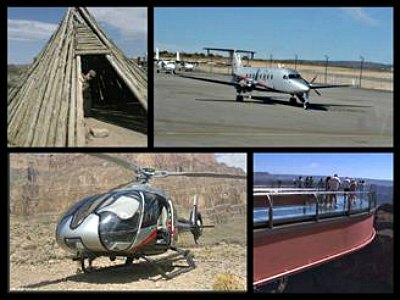 When your airplane lands at the Hualapai Indian Conservation Area, you will have the chance to do some sightseeing on a bus, visit Guano Point and Eagle Point, eat your free lunch or walk on the Skywalk (upgrade required). If you select and optional helicopter ride, the descent to the bottom lasts approximately 5 minutes. At the bottom, you will have 20 minutes to take in the views of the narrow, but powerful Colorado River. There is no more complete way to explore the West Rim and Hualapai Indian Reservation Area! 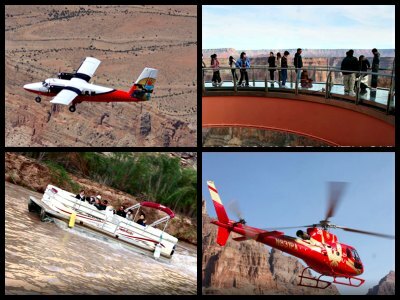 To make the most use of these comprehensive Grand Canyon air tours from Vegas, opt in for a descent to the bottom of the canyon on a helicopter and a boat ride on Colorado River. After your airplane lands at the Grand Canyon, board a helicopter that will take you to the bottom and land near the Colorado River. There, you will board a boat, and take a ride down the Colorado River! After your adventure at the bottom, you will ascend back to the West Rim, where you will have the chance to thoroughly explore both the Eagle Point and the Guano Point and enjoy your free BBQ lunch. These popular Grand Canyon air tours will take you to new highs and lows as you travel to visit one of the Seven Wonders of the World. You will enjoy hotel pick-up/drop-off on this 7 hour adventure that will first take you to Boulder City Air Terminal where you board a unique sightseeing airplane. After soaring above the remarkable terrain of Lake Mead and Hoover Dam you will land at the West Rim of the Grand Canyon. Here you will be taken by helicopter to the canyon floor and witness the splendor of the Colorado River as you peer upward at enormous canyon walls. Your third leg of the adventure is to climb onto a pontoon boat and float down the Colorado River. After your flight back to the West Rim you will enjoy a nice lunch around Guano Point before heading to the world famous Skywalk. With VIP access you will walk upon a glass bridge suspended some 4,000 feet above the canyon floor for this once-in-a-lifetime view. Return to Las Vegas via airplane as you view the skyline of Sin City before returning to your hotel with a lifetime of memories. Participants must have valid government identification per FAA rules to board aircraft. Want to see the wilder part of the Grand Canyon? Try Grand Canyon air tours of the South Rim! After a long, panoramic flight you will land at the South Rim, will take a walking tour of the park that offers plenty of photo opportunities. For even more fun, upgrade to add a scenic helicopter flight over the South Rim. 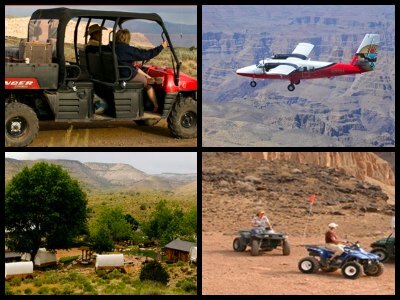 You will fly over Kaibab National Forest that hides canyons and prairies, over the scenic Dragon Corridor, and admire the incredibly beautiful vistas. South Rim is very different from the Grand Canyon West. It's less explored, more scenic, more wide and more deep, although just as gorgeous. Because it's located far from Las Vegas and any other city for that matter, it's less accessible, and fewer people have seen it. Do you feel like experiencing the magnificent wilderness of the South Rim? 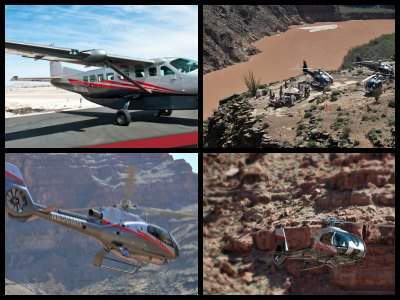 For an incredible Grand Canyon flying experience that includes seeing one of nature’s Seven Natural Wonders of the World from top to bottom is the Grand Canyon Connoisseur with Helicopter Tour. Your 9.5-hour adventure begins with complimentary hotel pick-up service where you will be transported to Henderson Airport. Here you will board a state-of-the-art sightseeing airplane. Once in the air, you will fly 70-minutes to the South Rim of Grand Canyon National Park. As you fly you will be pleased with the bird’s eye view of several iconic attractions such as Hoover Dam, Lake Mead and the colorful Mojave Desert. After landing at the Grand Canyon you will have time to snap a few photographs before boarding a specialized helicopter that will fly over the canyon for 20 to 30-minutes. During your flight you will have an excellent vantage point of famous places like the Dragon Corridor, Mather Point and you can catch a glimpse of people hiking on the Bright Angel Trail. After landing you will indulge in a free box lunch as you gaze out over the colorful Grand Canyon. Your Grand Canyon air tour concludes with another 70-minute airplane ride back to Las Vegas where you will be transported back to your hotel.